The following Abstinence / Fasting regulations are observed during Lent. They are grave obligations. Abstinence from meat on all the Fridays of Lent and Good Friday (April 19) by all Catholics 15 years of age and older. Fasting on Good Friday (April 19) by all Catholics who are 18 to 59 years of age. When fasting, a person is permitted to eat one full meal and two smaller meals which, together, would not equal a full meal. Fasting is not an obligation for those with a medical condition which would be made worse by fasting. We are grateful to all who have already pledged or donated to the 2019 Archbishop’s Annual Appeal. Your support helps fulfill our parish’s responsibility for the larger church, which is the Archdiocese. Our parish goal is $338,200. To make a pledge to this year’s Appeal, please visit https://donate.archatl.com. Be sure to designate Holy Spirit as your parish. The Lenten parish penance service will be held on Wednesday, April 16th, at 7:15 p.m. in the Church. We invite you to experience the power of God’s compassion during Holy Week by coming before Him in the sacrament of confession. The penance service will follow the parish’s annual Seder Supper. Bring your family and friends for an evening of prayer, fellowship and forgiveness. Annual Seder Supper - RSVP AND Sign Up to Volunteer Today! 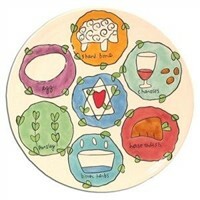 Deepen your Lenten experience by attending the Annual Seder Supper on Wednesday, April 17th. Steeped in tradition and rich in symbolism, the Seder supper will be held in McDonough Hall, just prior to our parish penance service. The liturgical meal, based on the Passover meal, begins promptly at 6:30 p.m. Reservations are required. Holy Spirit’s Annual Seder Supper cannot happen without all of our amazing Saints! If you or your family would like to become part of this annual tradition in a tangible way and serve the parish during Holy Week, please consider volunteering on the Sign Up Genius link. Help is needed with set up, serving the Seder Meal and clean up after the dinner. Thank you, in advance, for your willingness to serve. As we approach the Spring with all the portent of renewal, we thought it would also be a good time to replenish the shelves of the Food Pantry at Centro Católico. 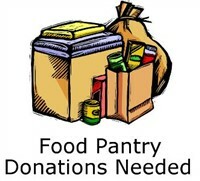 Food Items: Dried beans (pinto beans, black beans, chick peas), lentils, white rice, canned fruit (peaches), sugar, maseca (corn flour), vegetable oil (less than 1 quart), cereal (oatmeal & boxed cereal). Personal items: Diapers (sizes 5 & 6), feminine hygiene products (napkins or pads only), laundry detergent, shampoo, bar soap, diaper wipes, toilet paper. Our collection will run from until Sunday, May 5th. Thank you in advance for your generosity. We are streamlining sign ups for Adoration. Parishioners are now able to view all Adoration dates and times in a combined calendar and sign up for multiple days all in one place. No account activation is necessary! All you need is your name and email. Use this link to view Adoration dates and times and sign up for a time slot! Over 100 volunteers are needed to make Vacation Bible School a success! All parish adults are invited to volunteer! VBS will be held Monday, July 8 – Friday, July 12, from 9:00 a.m. - 12:00 p.m. Safe environment training is required. Please sign up on the Vacation Bible School webpage or contact Heather Kerutis. I want to update you on the zoning application that the parish and Holy Spirit Prep are working on for submission to the city of Sandy Springs. There will be a public meeting on Wednesday, April 24, at 6:00 p.m. in McDonough Hall. This is required by the City. We will present the latest version of our combined Master Plan. This includes the parish portion, which deals with parking and a retirement rectory, and some possible future needs. The School’s plan involved consolidating the Lower and Upper Schools by leasing a portion of our 13 acres of undeveloped land. We will field questions and feedback from those attending the meeting. Many neighbors are resistant to the plan and we expect they will voice opposition to the project. For the city of Sandy Springs to have a balanced view, it is important that we have people at the meeting to support our plan. So, I urge you to attend and to speak, briefly, to the attendees. Child care will be provided. (Please sign up your children for child care here.) We invite you to wear green that evening in support of the school. In August and September 2018, the school and parish hosted two meetings for members unveiling a 20-year plan for developing the wooded acreage adjacent to the parish. The plan included a rectory for retired priests, a parking deck, two Lower School buildings, and a recreational field. As part of the process to seek a conditional permit from the City of Sandy Springs, the city required that we host several public meetings. We held the first in October 2018 in the Upper School library. Following the meeting, we amended our site plans based on community feedback, reducing the amount of development on the property, and are prepared to present the updated site plan on April 24. In the meantime, some neighbors are resistant to the proposed plan, and have campaigned against it. They cite a 2003 agreement between the school and neighborhood limiting construction and enrollment. The neighborhood group that negotiated the agreement was administratively dissolved in 2005, which legally nullifies the terms of the former agreement. The parish and school teams have met with neighbors on a number of occasions, but no agreement has been reached. We continue to seek such an agreement. At the April 24 meeting, we will provide an opportunity for attendees to voice their feedback on the campus plan. You can wear green in support of the plan. The proposed parking deck is critical. This will give us the additional space to accommodate parishioners, especially on Sunday mornings. I hear many complaints from parishioners who have great difficulty finding a parking space, especially at the 10:00 a.m. and 11:30 a.m. Masses. The Archdiocese has a number of retired priests. If we have a rectory which would accommodate them, it would give us the benefit of them being able to assist us with Masses, and other pastoral services. Having the Lower School and Upper School facilities on the same campus benefits us in that the priests will not have to go back and forth between the facilities. It also benefits the parish because we can use those facilities for religious education on weekends, and other meeting, such as adult education, retreats and the like. Msgr. Edward J. Dillon, J.C.D. The Archdiocese of Atlanta is pleased to announce that a Farewell Mass, in honor of Archbishop Wilton Gregory, will be held on Sunday, April 28, at 2:00 p.m. The Mass will be celebrated at Marist School, 3790 Ashford Dunwoody Road N.E., Atlanta, GA 30319. 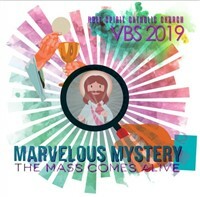 The Mass will at the Centennial Center in the Young Gymnasium. Although this location is spacious, we anticipate a large turnout. For this reason, please encourage anyone attending to arrive early. We will have an overflow area where the Mass will be viewable on large-screen televisions. In addition, the Archdiocese of Atlanta faithful may send messages of love and appreciation to Archbishop Gregory via email to ThankYouArchbishop@archatl.com or in social media on the Archdiocese of Atlanta Facebook, Twitter and Instagram accounts.